Bajaj's Indian KTM may not be universally liked or have Splendor-beating sales (and there's a thought and a half) but there is no dissent when you look back on the last two years and realise that the two KTM Dukes have irreversibly altered the price-performance equilibrium. Then the 390 Duke arrived for testing and proceeded to blow us away and left us itching for a head to head - though lamentably, there is no direct performance or displacement competitor. However, the Honda C-ABS is almost the same price as the 390 and this test just had to be done. If the goalposts have been moved, should we  terminally infected with the spirit of scientific enquiry - not at least find out how far? Vikrant and I rode the bikes back to back to figure out how the two Rs 2.1 lakh bikes stack up. Here is what happened. They are chalk and cheese these two. 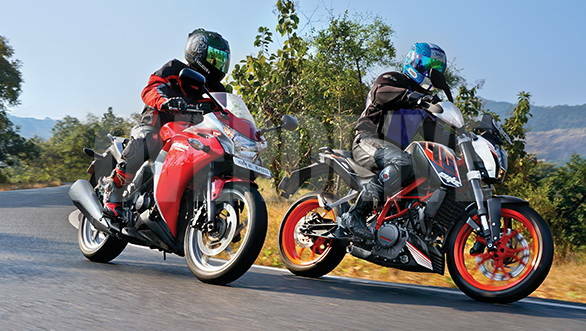 The 390 Duke clearly is a wiry, spare naked street bike while the CBR250R is a substantial faired sportsbike. Neither is without nits for us to pick, though. For the KTM the issue is one of familiarity. At the 390 global introduction in Salzburg, Craig Dent of Kiska Design told us that when it became time to design the 390 Duke, they looked at the 200 and thought how wonderful it looked. And then stuck to that design, altering smaller, though visually important elements like the trellis frame colour, wheel colour and stickering. The positives of this approach? The 390 looks distinctively like it was Austrian-born, thoroughly modern and extremely sharp and angular. The orange trellis looks great though the orange wheels, personally look a bit too loud for my taste. Vikrant disagrees and thinks they look good but the paint on wheels could have been better. On the flip side, it looks like a 200 Duke with bright paintwork. I understand that a different design would make the bike more expensive but deep inside I still wish Bajaj-KTM could have given it more differentiation. Build quality is good but I think finish can improve. I think the mass of wiring snaking around the engine makes the 390 look messier than the 200 though otherwise the 390 looks neat and well-made. In contrast, the CBR250R is of course, clad in VFR1200F-inspired plastic and it gives the motorcycle a substantial, calm looking presence. And in the new Repsol-colour scheme  which comes at an extra cost  the CBR250R looks extremely fetching. But the CBR's niggle is that it isn't as well-built as we expected Hondas to be. The odd bolt will show rust and there just isn't the sense of flawless quality that is normal with Hondas all the way from the Dream Yuga to the Fireblade. The other thing is that now Honda has shown the CBR300R to the public and that isn't a mini-VFR it's a mini-Blade and I think it looks vastly better than the CBR250R  sharper, more focussed and even prettier. Between the two? I'm surprised to say the finish levels as well as build levels are slightly better on the KTM and the automatic Honda victory in this department has escaped the CBR250R. The styling is even stevens since we aren't comparing two nakeds or two faired motorcycles. If you like your bikes wrapped in plastic, look to the CBR. If you like your bike with all the mechanical bits out there gathering muck and all that, the KTM will be more to your liking. Worryingly, that means the KTM is marginally ahead before we get to the meat of the test. Oh dear. The Honda CBR500R makes 47PS from its half-litre twin. That's 3PS more than the KTM's 373cc single. Which means with just 249cc in displacement and 25PS, the CBR250R isn't even in the performance ballpark. The thing that makes this whole thing seem even more out of whack is that the two bikes are nearly the same price. Out in the real world, the Honda actually has a likeable engine. It will hit 151.82kmph flat out  that's true speed not indicated optimism so it isn't slow. 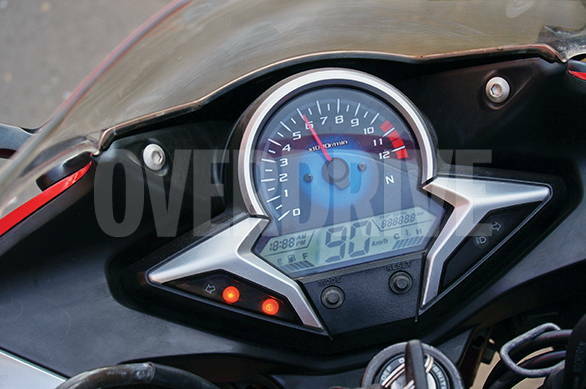 But the CBR prefers torque to power and makes 22.9Nm at 7,000rpm and lets the torque define its brand of performance. Rolling on the throttle at any revs on the Honda produces a lovely surge which can be addictive and in traffic, useful. Out of the urban jungle, 90kmph is a smooth 6,500rpm in top gear. Between the soft seat, spacious accommodation and the stable, big bike feel, Honda gives you a touring package that we reckon is amongst the best on sale in India today. It isn't too bad on economy either, returning 26.7kmpl in the city in our tests, and 37.2kmpl on the highway. Overall, 29.3kmpl gives it a staggering tank range of 381km, in fact. Of course, there is a catch. If you raise cruising speeds past 120-125kmph, the Honda begins to drink quite a bit more and highway range will fall dramatically to something like 250km. Plus, at these speeds you'll notice the effort the engine is making as high speed bar vibes as well. But all this becomes insignificant when the 390 Duke enters the picture displacing 125cc more and producing 17PS more power to boot. And wait, there is more. The Duke also happens to be 20kg lighter than the CBR250R. The difference in performance is so vast that the CBR is comprehensively outgunned. 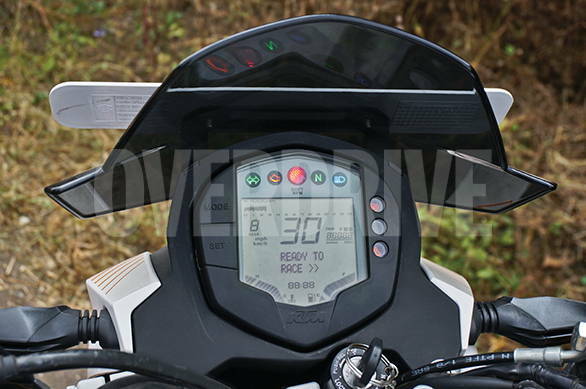 The 390 Duke needs just 2.7s to get to 60kmph a point the CBR reaches just over a full second later. In three more seconds, the Duke passes 100kmph, while the Honda needs 9.2s for this. 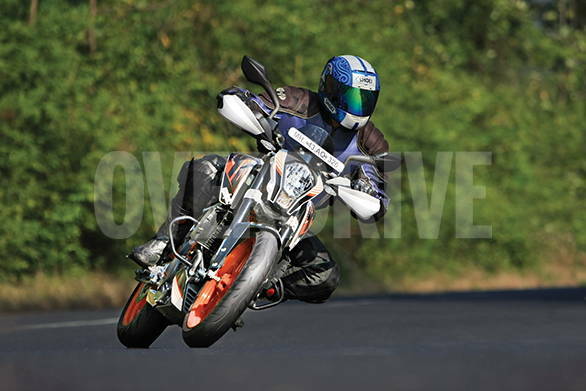 At 168.5kmph (true), the KTM is also a full 17kmph faster flat out than the CBR. What makes the 390 more thrilling is not just the performance but also the nature of that performance. It will get to 140-145kmph without any drama or fuss and in no time at all. At idle there are some bar vibes and the idle itself is uneven. Below 3,000rpm you'll hear the engine stutter a bit too. But cross 4,000rpm, and it's like the sun coming out after a long dreary winter. And from 5,000rpm to redline, the KTM is sunshine and puppies. The engine produces remarkable mid-range as well as top-end performance while feeling throaty and focussed but never stressed or strained. The killer is the unhurried feel of the engine. Where the 200 Duke also accelerates hard, it's thrash metal to the 390 Duke's Eric Clapton. And get this, 120kmph in top gear on the Duke is just 6,500rpm which means all-day fast cruising is eminently possible. And if you're going to ask economy, check out the spec table, the KTM is behind, no question, but you'll be surprised at how small the difference is. The story is similar when it comes to dynamics as well. The KTM dominates by not only coming with superior equipment but by using that to full effect. It gets vastly superior tyres for example, and the Metzelers make an enormous difference to overall grip and your confidence in the chassis. One of the reasons for this is that the KTM seems to have its goals much clearer than the CBR in terms of role. In the quest to be a sporty naked, it offers a stiffer ride quality that works brilliantly in the corners and on good roads. On worse roads, the KTM gets jittery and bouncy and the grippy rock-hard seat in this situation is not an asset. But what it does well, it does devastatingly well. It drops into corners fast and hard while the Metzelers give you far more confidence at deep lean angles than the 200's MRFs used to. The result is a cornering platform that you can really push very hard. It's stable enough mid-corner and the sense of hook-up and drive exiting corners is a proper thrill all on its own. And just as the Duke fills your head with speed, the brakes shed momentum rapidly too. The strong brakes deal well with the lighter bike and have standard ABS which means even grabbing a clumsy handful of front brake produces little more than extremely quick shenanigan-free stops. 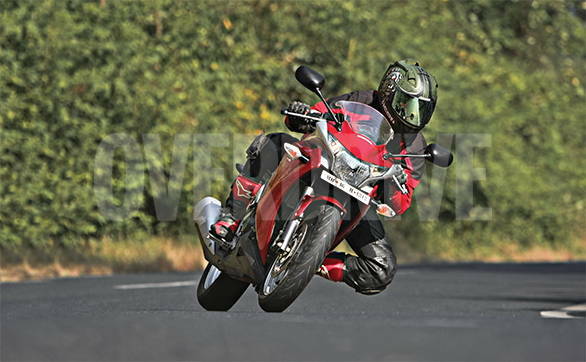 The CBR250R in comparison aims to find the right balance between great handling and ride. And it does too as long as you don't push too hard. At normal highway speeds, the CBR feels utterly trustworthy and stable and this is rewarding enough a sensation for you to not notice the fact that it doesn't turn especially quick. It also has great ride quality for a sportbike. It absorbs bumps quite well and that makes it quite easy to live with in our shattered cities and makes it wonderful on long highway rides. However, the ride costs the CBR when you light the wick and ride it properly hard. Then you'll sense that the CBR weaves and wallows and the sensations substantially block you from riding it any harder. As the significantly stiffer-sprung race CBR's show, the chassis actually has lots and lots of capability, but the stock suspension doesn't allow the handling to come out and shine. 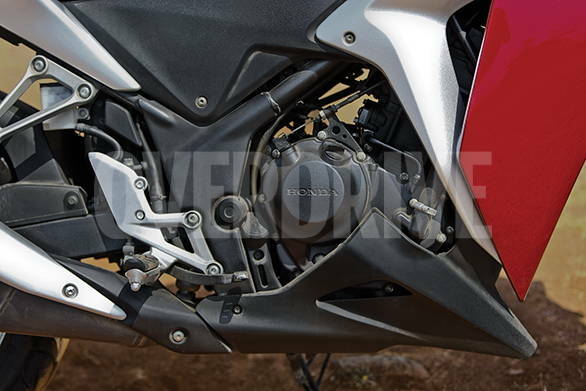 On the brakes, the CBR is friendly rather than sharp but it backs this up with strong power and the ABS is extremely effective at producing sharp stops as well. You might say at this point that there seems to be no point in buying the Rs 2.13 lakh CBR at all, right? Well, there are three reasons to buy the CBR over the KTM. First, the KTM feels like a hopped-up small bike while the Honda feels like a manageable big motorcycle. That difference in sensation shouldn't be overlooked. The KTM's role-focus also means that it appeals to a narrower band of enthusiasts and the Indian enthusiast who craves the big bike feel will not get it from the KTM. Second, the KTM might have the engine to ace highway work, but it also has an extreme footpeg position, a rock hard seat and no space for the rider to squirm and no pillion space and consequently hardly any space for luggage. Some of these are fixable with mods, but the tank range from the 11 litre tank is not going to be easily fixed. In contrast, the CBR might cruise slower overall, but its seat is more comfy. there is space for both rider and pillion and the CBR takes very happily to large, filled to the brim saddlebags as well. In some ways, you'd almost agree that there's is more VFR in the CBR than CBR. And third of course, is that it has a fairing. It sounds silly but the fairing is a big ticket item in the value proposition for motorcycles today and the 390 Duke doesn't have one. Although this particular advantage will be nullified shortly when the RC390 arrives. What this means for Honda is that the CBR300R isn't something they should be mulling over, it should be something they need to bring to the market post haste. It troubles me that the CBR300R will be slightly more expensive than the 250 which means it might end up matching the RC390 on price. 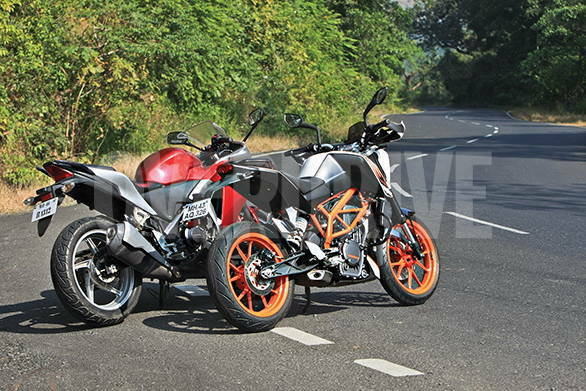 Will the 31PS 300 have the wherewithal to go up against the rapacious KTM 390s? Let us know your thoughts, please. 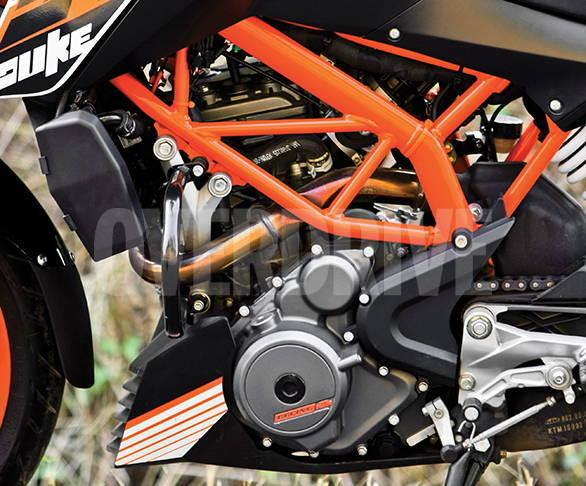 Which brings us to the KTM 390 Duke. The 390 Dukes fixes all of the things that people didn't like on the 200 Duke while keeping the best bits and amplifying them. All this at Rs 2.04 lakh on-road (when tested) is a masterstroke. The bigger spread of torque and power is matched to gearing that allows you to trundle gently, buzz hard in the mid-revs or bash with epic enthusiasm into the rev limiter. Every corner offers you the option of two or three gears and the tall sixth is a lovely addition to the arsenal. I do wish Bajaj gave the 390 Duke better levers, a better seat and a bigger tank for better highway range. But as it stands, the KTM 390 Duke represents stunning performance for a relatively small outlay. A proposition that is currently without equal in India.